So I know that paraphrasing someone else’s title in order to attract attention is a cheap trick. But I have a sneaky feeling that if I called this post something like ‘The Life Cycle of the Cycad’ people not so interested in cycads (of which I recognise there may be many) might not read it. And I’d hate for you to be missing out! Because who would have thought that a garden terrace in downtown Puerto Pollenca would see so much action? We’re not just talking sightings two days running of a Pine Marten, (see Pinch Me post) which is one of the creatures that David Attenborough has never seen in the wild but wishes he had. There’s another extraordinary thing happening out there which I simply have to tell you about. 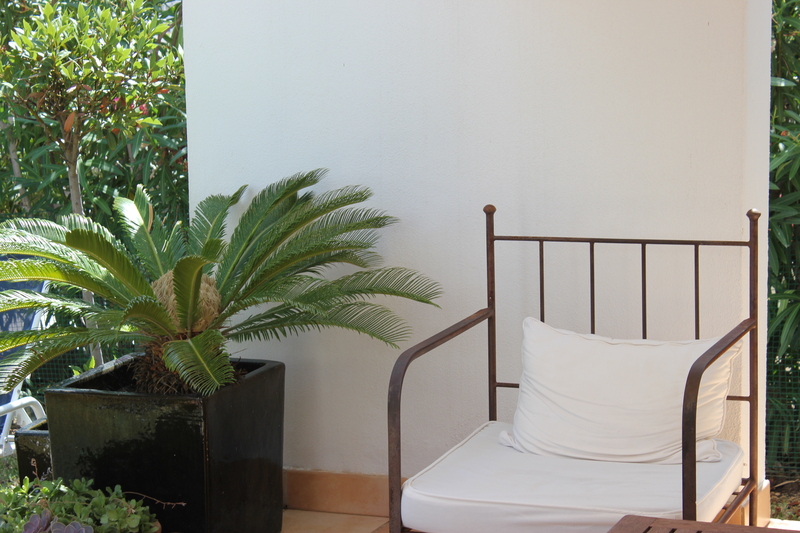 A couple of years back, when I arrived in Majorca after a winter at home, it was to find that the cycad (for those cycad novices that’s the frondy green plant in the black planter) on the terrace was behaving rather strangely. 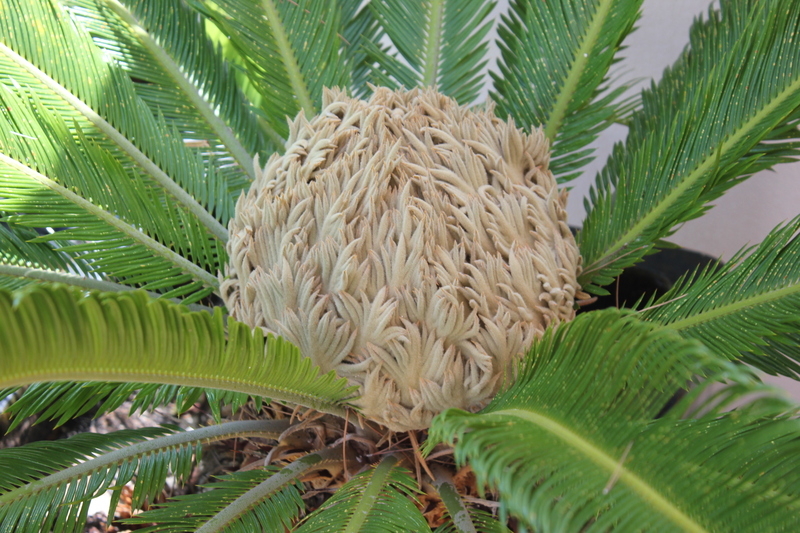 A cycad with a head the size of a football. Is that normal? I kept a close eye on developments. The head grew bigger. It was unnerving. By the beginning of this year the weird eggy looking things had gone a bit flaccid. When we arrived from the UK in June the few remaining leaves had began to go brown. I prepared myself for the worst. Clearly this was a cycad on its last legs. And it’s not just one cycad. Now there are four!!! Three little baby cycads are battling it out for space in a very crowded planter. Now if you happen to be an expert on this kind of thing, you will probably tell me that this is entirely normal behaviour for a cycad and only to be expected. But to me it’s… well, quite frankly, it’s very curious. Ha Ha!!! I just love the way you write Jane! You have such a brilliant sense of humor! I can imagine you were a bit alarmed about the behavior of such a peculiar plant. We have them here and they do all sorts of weird things like that. 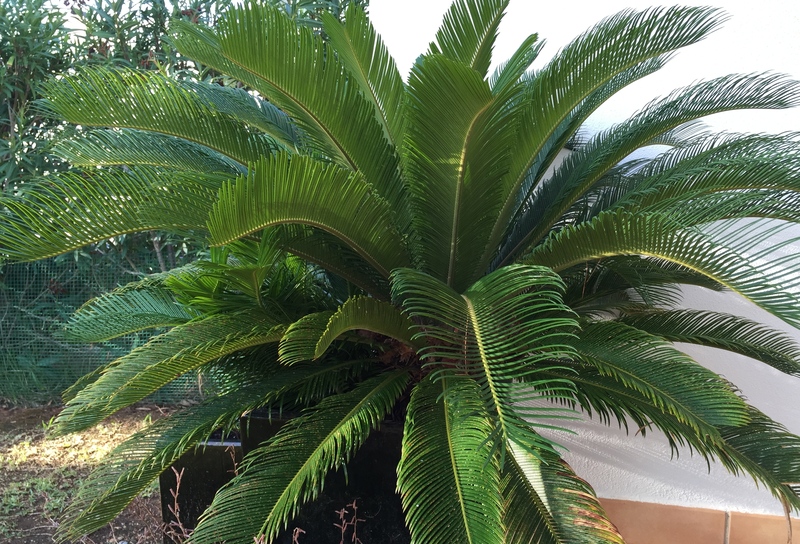 Some of mine that I had would drop their leaves entirely and then regenerate again, but then its probably because I tortured them with bad gardening behavior…But if yours produced Cycad babies I would say it is a very happy Cycad and loving its life in Majorca. 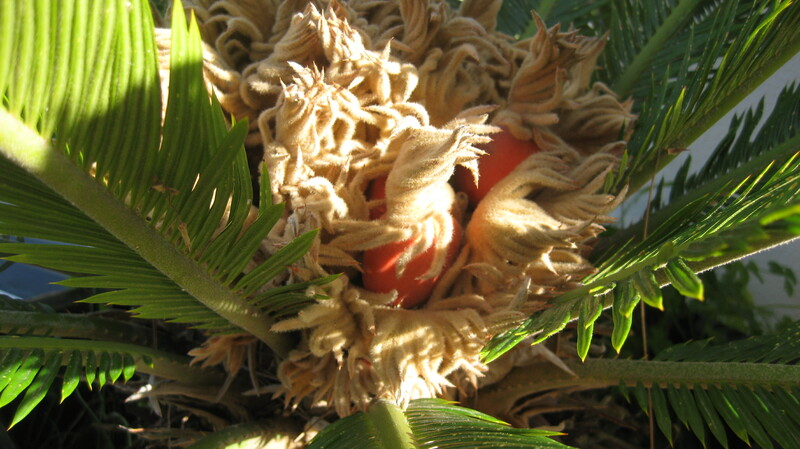 Can you separate the babies out the next time you are back and have a Cycad family?! So sorry it took me so long to reply to this, also. I think it was one of those things that now the weather is not so hot, I went out into the garden to attend to something and didn’t return until 3 days later! Hi Kate, lovely to hear from you. And great to hear that my Cycad isn’t behaving abnormally! I so appreciate you taking the time to comment, particularly when you’re so busy in your own garden. I’m very familiar with that phenomenon where you go into the garden and disappear into a kind of time freeze Bermuda triangle!